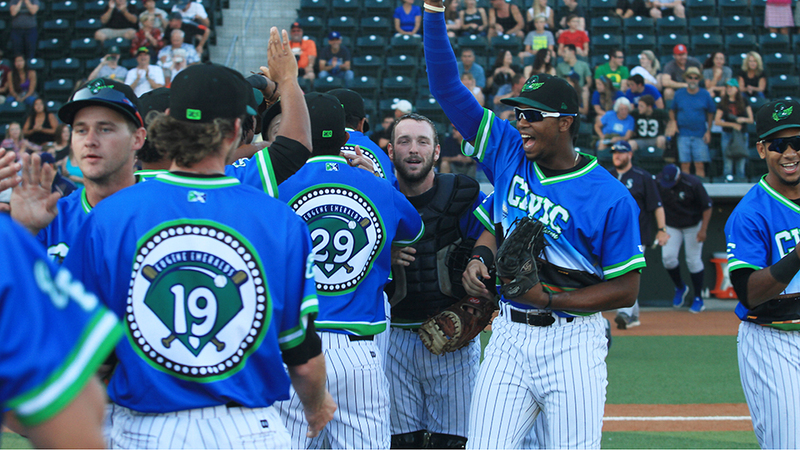 On a day in which they wore special jerseys to commemorate the burned-down Civic Stadium, the Class A Short Season Eugene Emeralds couldn't have given their former home a better tribute. On Sunday, Preston Morrison, Kyle Twomey, Luis Hernandez and Trey Masek combined to pitch the first no-hitter for the Emeralds in 47 years in a 3-0 win over Everett at PK Park. Robert Snyder hurled the team's last one in a 3-0 win over Medford on June 23, 1968. The team wore special commemorative jerseys in honor of Civic Stadium, which had been the club's home from 1969-2009, but burned down on June 30. Morrison, an eighth-round pick by the Cubs in this April's Draft, started things off with three perfect innings, striking out four and lowering his ERA to 0.66 on the year. "It felt good to go out there and have two of my three pitches working, keeping the ball down in the zone and letting my defense work a little bit," the North Carolina native said. With each pitcher limited to no more than three innings, Eugene's coaching staff sent 13th-rounder Kyle Twomey to the mound to begin the fourth. "At that point, it really hadn't even occurred to me that there was a no-hitter going on," the southpaw said. "I just kind of came in expecting to do my part for my three innings and just pass it on to the next guy after me." Twomey worked the AquaSox lineup -- which leads the Northwest League in runs scored (307) and stands tied with Salem-Keizer for the lead in average (.266) -- by relentlessly pounding the zone with his fastball to try and get early contact. He left after the sixth, after fanning three and walking one in his three innings of work without noticing the string of zeros on the scoreboard. "Honestly, it didn't cross my mind at all," Twomey said. Meanwhile, Morrison returned to the dugout just in time to notice the growing excitement. "I actually didn't see a couple innings because I had to do some exercises and ice my arm," the 22-year-old said. "When I came out there and saw that we hadn't given up a hit through six, you know, that's when you start really getting into that point where people are starting to think about it." Next up was Luis Hernandez, who had made only two appearances with the team this year and given up three runs in three innings. Though he issued two walks in his two innings, the native of the Dominican Republic struck out four batters to carry the no-hit bid to the ninth. Emeralds manager Gary Van Tol summoned Trey Masek for the final frame. The right-hander got Drew Jackson to ground out to first and 14th-ranked Seattle prospect Braden Bishop to pop up to short. Logan Taylor struck out to trigger the celebration. In the dugout, Twomey had joined Morrison to watch the final two frames. Upon the last out, they hugged quickly before rushing out to the mound. "We were both kind of excited, kind of biting our nails for the whole last three innings," Twomey said. "It was a pretty awesome release of emotions. We all kind of ran out onto the field and just tried to enjoy the moment. It's pretty special to be able to do something like that and I was really fortunate that I was able to be a part of it." "It's a lot of fun, especially because tonight was a night honoring the late Civic Stadium," added Morrison. "It was just special to do that on a night like tonight." Twomey, who had thrown a no-hitter on his own at El Dorado High School in Placentia, California, said the two don't even compare. "I've never been a part of anything like that," he said. "It's one of those moments I'll be able to share with those guys for a long time." Alex Kraft is a contributor to MiLB.com. This story was not subject to the approval of the National Association of Professional Baseball Leagues or its clubs.